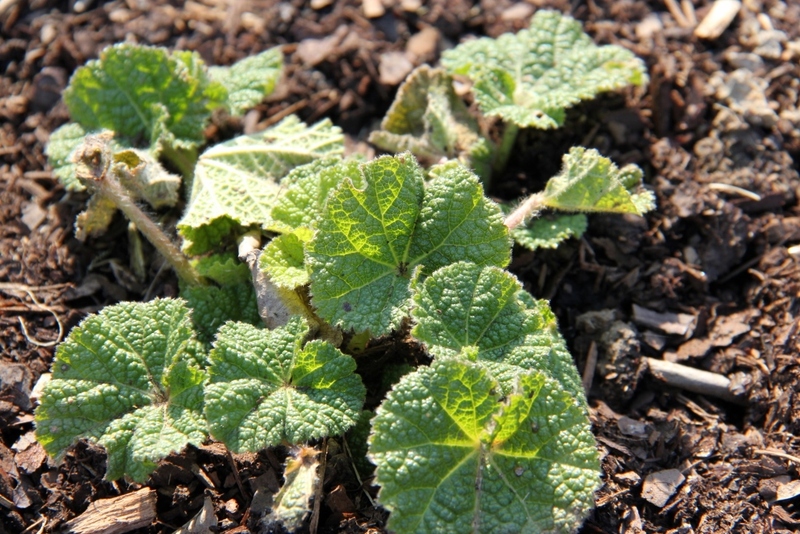 Alchemilla mollis is one of the star plants in my garden. 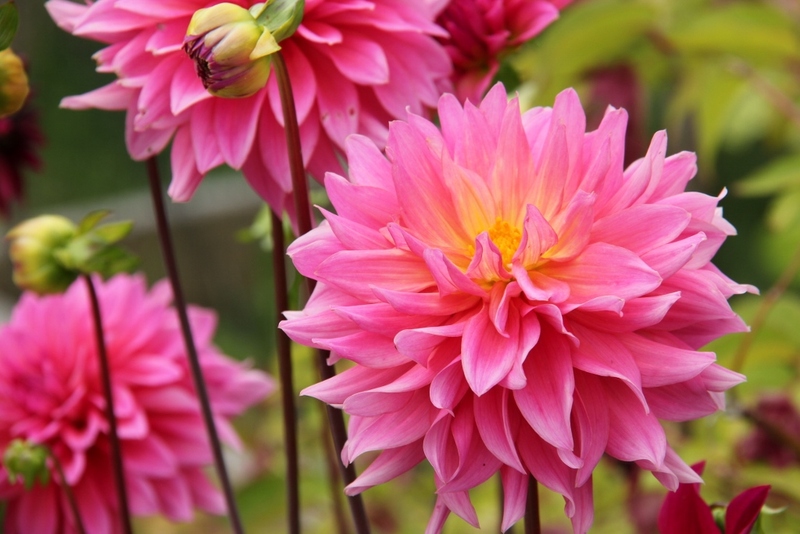 Not because it is a prima donna-showstopper, but because it is such a good doer, an easy-going plant that seems to be happy anywhere. It may not be a attention-grabber like a more showy plant like a rose would be, but it is a trustworthy filler plant with its lime green frothy flowers that look great with anything. In our heavy clay soil that is frequently either water-logged or dry as concrete it is the most reliable plant that I have, surviving in conditions (like dry shade) where other plants just give up. 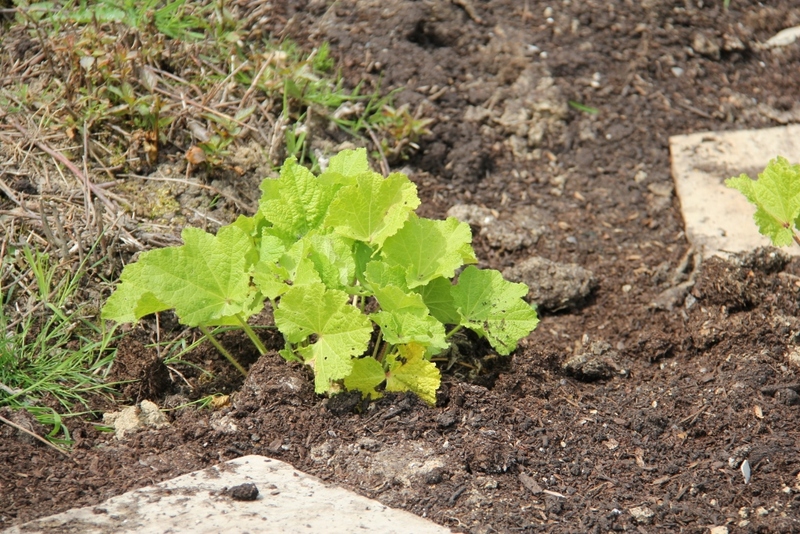 And as it self-seeds quite readily, I have little Alchemilla plants popping up everywhere, which I am more than happy about because I just move them wherever I happen to have a gap in my flower beds. And I love the way it looks like in a vase, so natural and pretty, and it lasts easily for two weeks. A most useful garden plant, in other words. Given that I have Alchemilla everywhere in my garden, I was delighted to learn from Colour Cottage that you can also dye with it (thank you Pia for the tip!). So when the time came to cut it back after flowering, I had lots of material to use in my dyeing experiments. I simmered a pot full of Achemilla leaves and flowers for about an hour. Once the dye liquid had cooled, I added some wool and silk into the pot. I didn’t have the time to simmer them at this point, so I just left the pot for a week (well, actually it could have been more like two before I got round to dealing with it, it was beginning to have some mould on top if I am completely honest with you…). 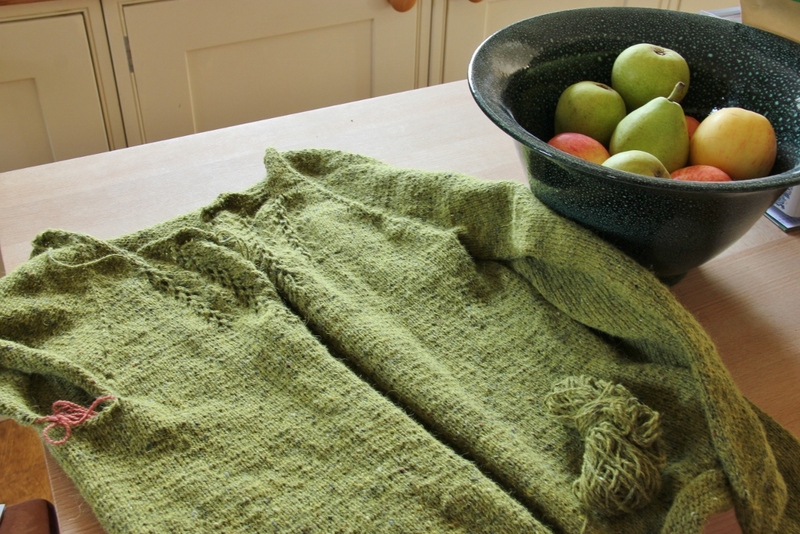 Finnsheep top dyed with Alchemilla mollis. 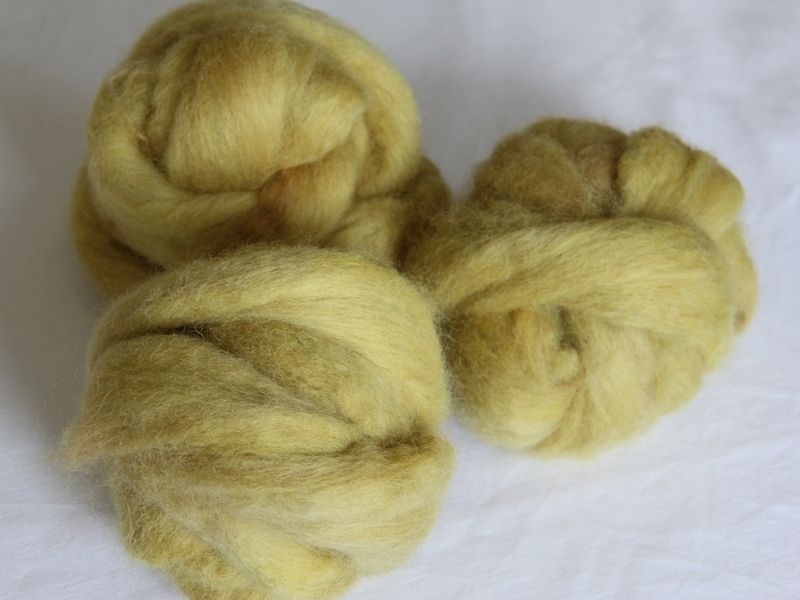 With alum you get a lovely soft yellow, with a slight mustardy hint to it. Alchemilla mollis gives you soft mustardy yellows with alum and not very exciting browns when you mordant with copper. It doesn’t respond much to pH, acid makes it slightly paler and alkali slightly more intense, but the difference is not so great I’d bother using these modifications in the future. My alum+iron+alkali sample mysteriously got lost in the process. This year, to control the costs (as well as the size of my yarn stash) I decided to try all the different colour modifications (ie. 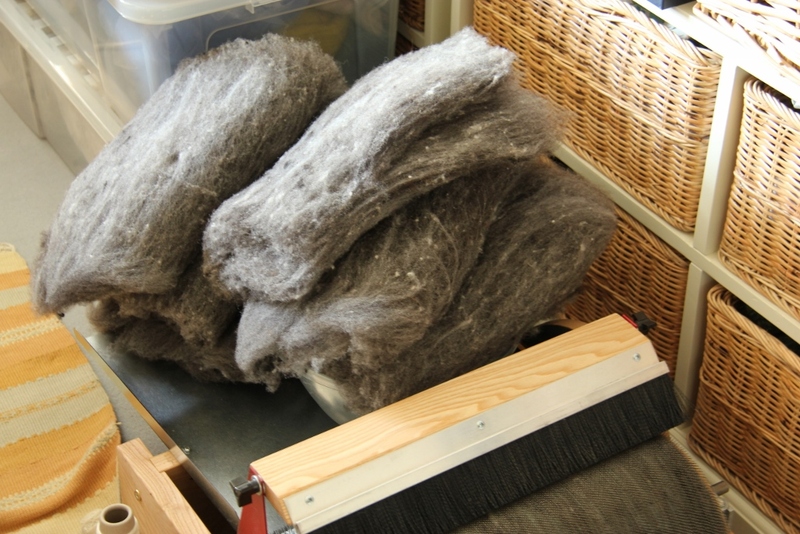 after-baths with acid, alkaline or iron) on little pieces of felt rather than yarn. Given that not all dyes respond to pH for example, you can end up with lots of wool of very similar colour and I felt using large quantities of yarn for these experiments was a bit too yarn- and money-consuming. And I got fed up with making lots of little sample skeins, as I would need so many of them (8-12 for each plant) and it’s tedious and time consuming process to be make. Felt samples are quick to prepare, and if the experiment results in dull colours it doesn’t really matter too much. For similarly frugal reasons, my main dyeing material at the moment is Finnsheep top, using unspun wool is more versatile than yarn as I can either spin it into yarn of any thickness I like or I can felt it. I do dye some yarn too, but only small quantities for specific purposes. 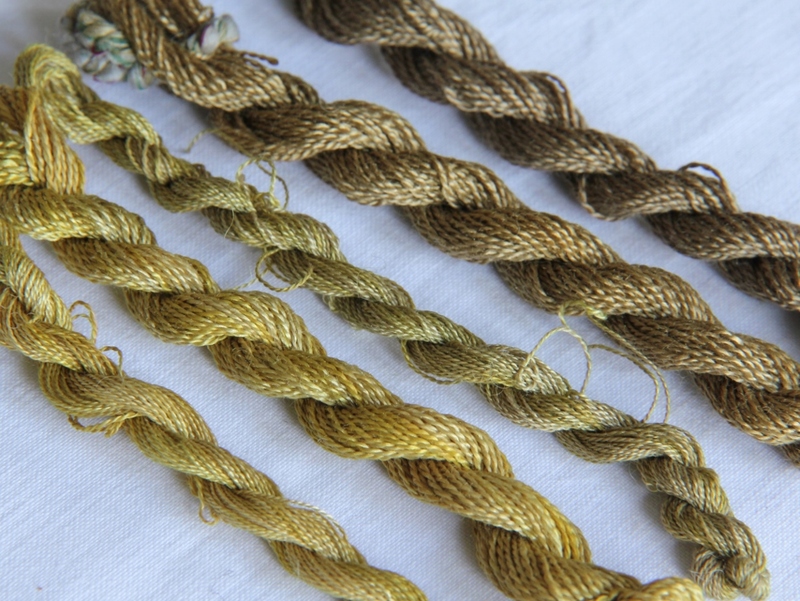 Despite all that I still couldn’t avoid having to make some little sample skeins though, as this year I wanted to try dyeing some silk and I though building a naturally dyed embroidery silk collection would be a great way of experimenting with silk dyeing. 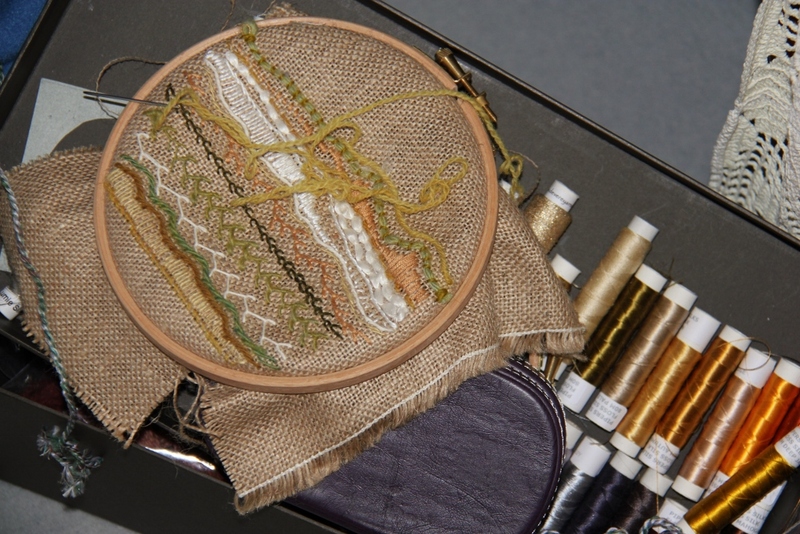 Not that I am a big embroiderer at the moment, but it is something I’d like to do more of (one of these days when I have the time and energy) and obviously this gives me an excuse to build (yet) another stash. 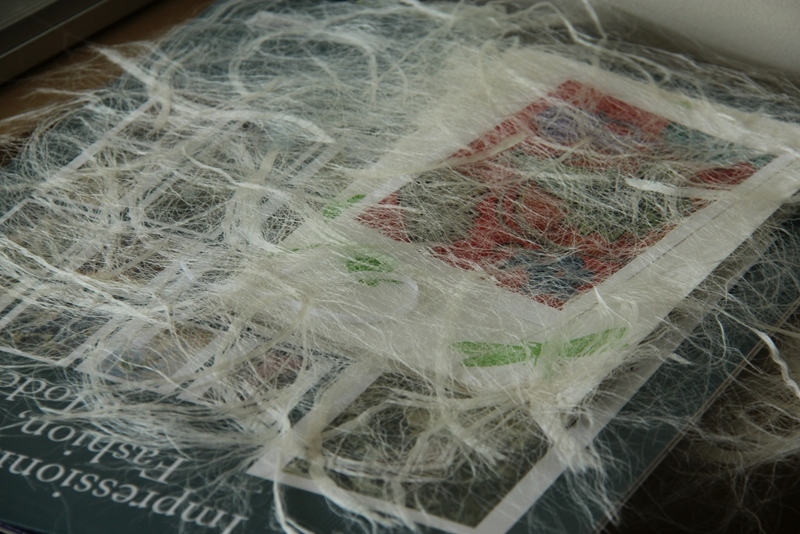 embroidery silk dyed with alchemilla mollis. From bottom left: alum, alum, alum+iron, copper, copper+ iron. I haven’t dyed silk before, so I was delighted to discover how it just soaks up colour, the colours somehow look more intense compared to wool (and it’s interesting to note they are not always the same as with wool). And the complex colours of natural dyes go beautifully with the luxurious lustre of silk, I just love the results. To mordant silk I use exactly the same method I use with wool. I cold mordant it with alum formate or simmer it with copper and citric acid. 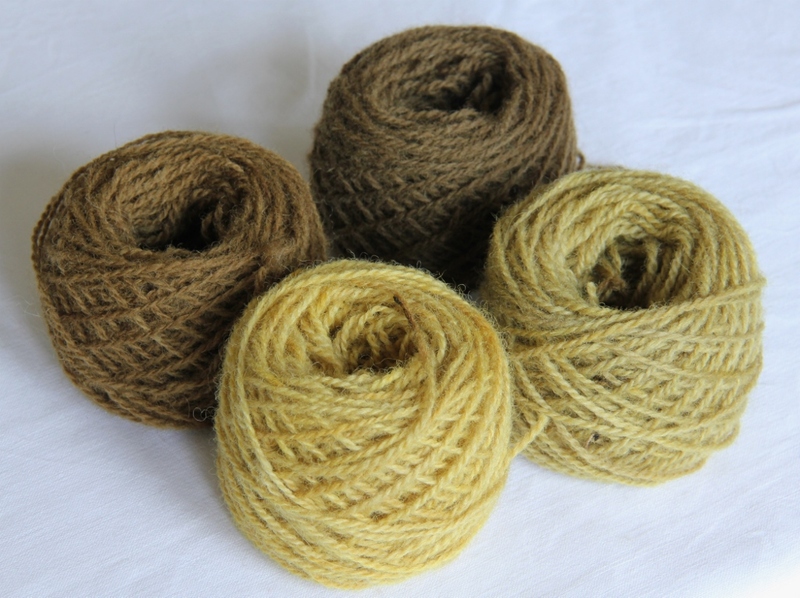 Yarn dyed with Alchemilla mollis. Clockwise from left: copper, copper+iron, alum+iron, alum. 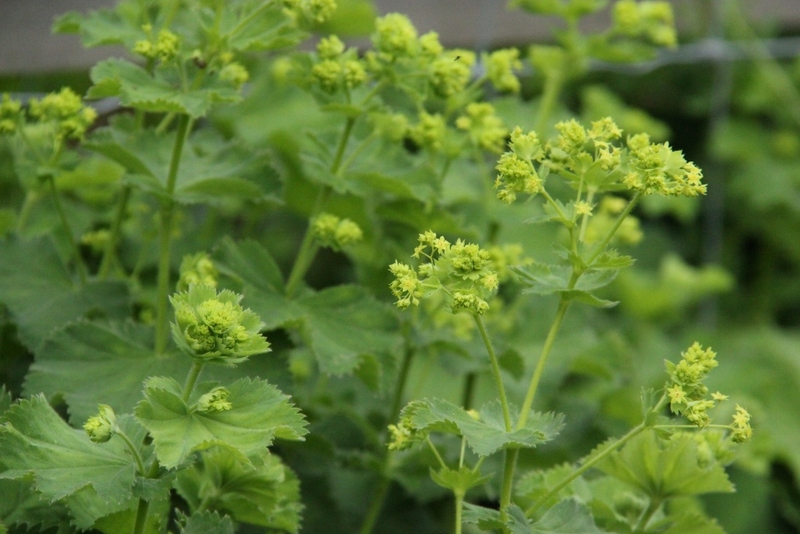 The colours you get with Alchemilla mollis are not necessarily that remarkable – after all you get yellows from so many plants. And the copper mordant gives you slightly uninteresting browns. 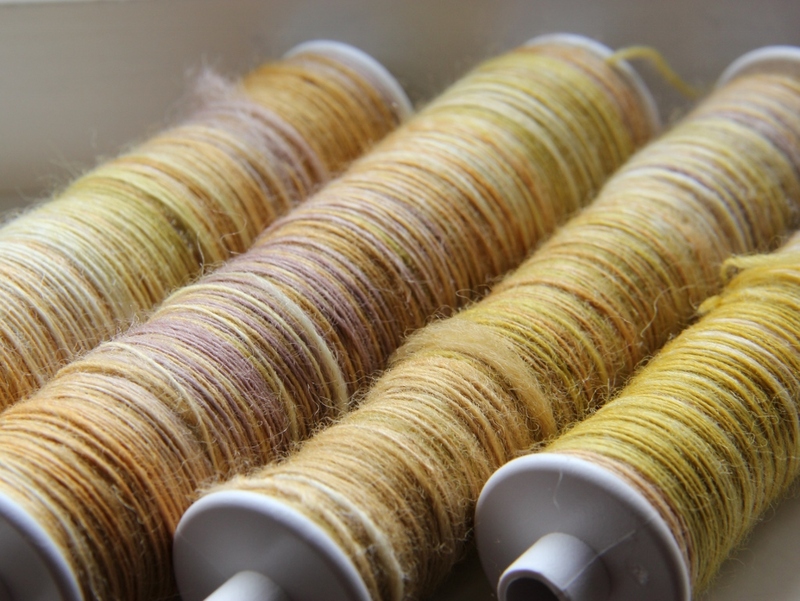 But I particularly like the softness of the yellow you get with alum, it is not bright and brash at all, slightly mustardy just to make it look a bit more interesting than a standard bright yellow. A wonderfully complex colour so typical of natural dyes. And if you go easy on the iron (not like in my felt samples that went nearly black), alum mordanted wool becomes a nice soft olive green. I am thinking one day I’d quite fancy a jumper or a cardi in one of these colours, which is quite doable as I have so much of this plant around. Categories: Brown, Colour Files, Dyeing, Yellow | Tags: brown, dye plants, dyeing with Alchemilla mollis, natural colours, natural dyeing, yellow | Permalink. Ah, harvest – that time of the year when the hard work earlier on is finally beginning to pay off. That time of the year when the greenhouse is full of cucumbers and tomatoes, and after a month of eating courgette with every meal you frantically search around the internet for any new exciting courgette recipes that you haven’t already tried (note to self: five courgette plants in a household of only two people is definitely way too many!). That time of the year, when you are just about ready to start picking all those gooseberries that you have so anticipated being able to eat, just to notice that they have suddenly been eaten by some mysterious nocturnal beastie – just like that – over night – with not a single one left. I dry many of my dye plants for later use. My netting tower is completely stuffed at the moment. Despite some of the challenges in my dye garden that I wrote about in my last post, there is plenty of material there to be getting on with. If I am planning on using flowers for dyeing, I rarely use them fresh as I don’t often have enough at any given point for a decent batch, so I dry them and use them once I have accumulated enough. So flower harvesting has been the number one hobby this month. After a cold first half of the year, the weather has finally realised it has some catching up to do so we have been having an unusually long heatwave here in the UK. As lovely as it would be to spend the warm evenings lounging around in a deck chair, enjoying a glass of wine, the reality hasn’t been quite like that (I suppose it never is). The hotter it has been the more work there has been in the evenings, trying keep all my new plants watered and alive. So I have been spending my summer evenings rushing around with a garden hose, then with legs already seriously wobbly, picking up all the flowers that are past their best and trying to find a flat surface for them in the outbuilding that is not already covered with flowers. Actually, despite the element of franticness in trying to get everything done before collapsing completely, I really do like that bit. On a sunny evening there is definitely a moment of serenity there, with the sun going down, the air cooling and my plastic crate being filled up with wonderful colours. That’s my favourite part of it all. A month or two ago I was slightly worried that I might not have the stamina to do any dyeing this summer at all, but luckily my energy levels have picked up a little bit (perhaps it is all that sun and vitamin D) and now, after all the essential house and garden jobs (and all that plant watering) are done, there is just enough energy left over to do a bit of dyeing. I love solar dyeing, just chuck stuff into a jar and leave them until you are ready to continue with the process. In this case I have pre-boiled the plant material and discarded the plant bits before placing the dye liquid in the jar, as I find that decomposing plant bits can stick to unspun wool easily if you leave it for too long (as I often do). It is going slowly, and it feels quite strenuous at the moment, so the materials are often left in dye pots for days before I have the energy for the next stage, but that doesn’t matter. That’s the thing I like about natural dyeing, it’s pretty flexible in that you can stop the process in many places and wait for a few days (or even weeks as the case may be) before you continue. Given that it is going so slowly, I haven’t quite got to the stage where I am ready to show any actual results, but meanwhile I thought I’d give you another quick tour of the harvesting activities that have been going on. 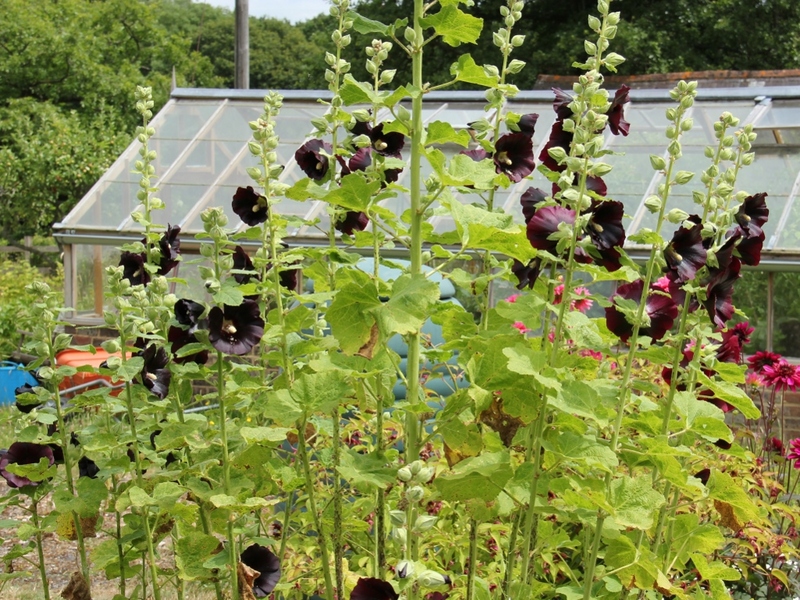 Of the different-coloured hollyhocks, the black one seems to be the one that makes the most interesting dye colours. This is my first ever batch, so I am so looking forward to giving it a go! 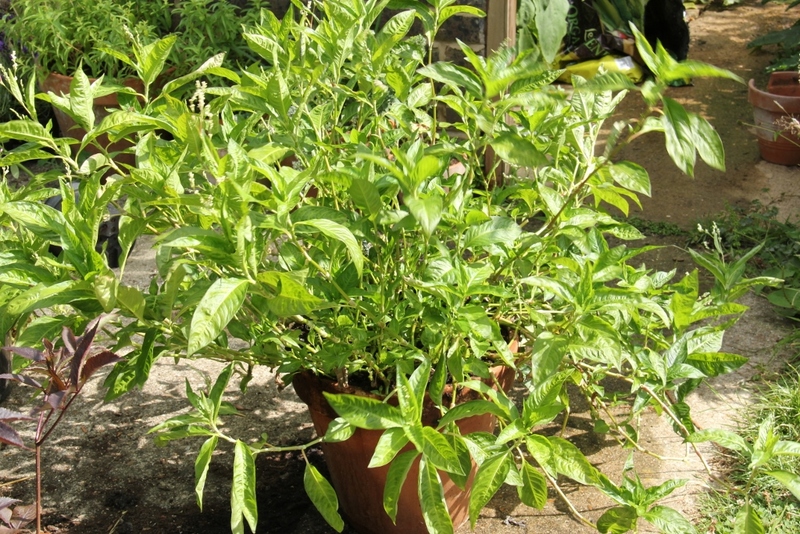 Japanese indigo needs a long warm season to make seeds, so I am growing one of my plants in a pot so that in the spring and autumn it can be kept in the greenhouse. 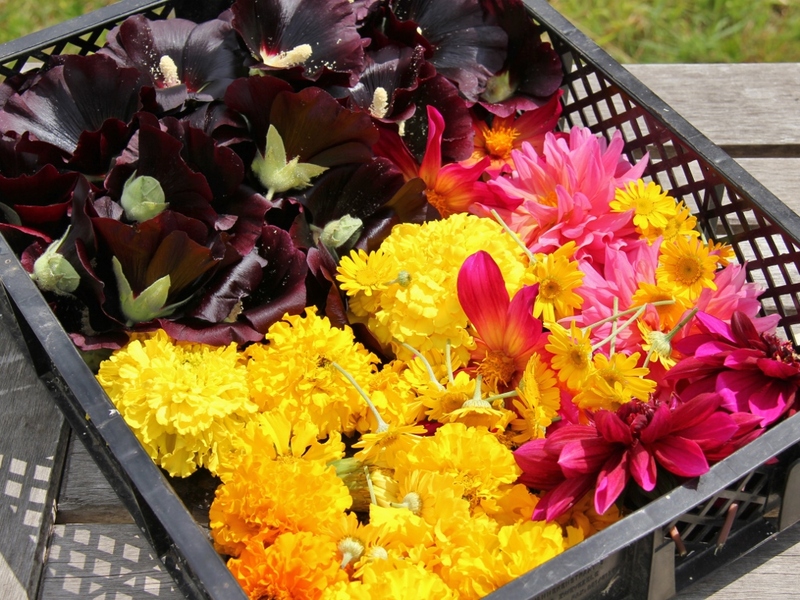 Categories: Dyeing, Growing Dye Plants | Tags: Alcea rosea Nigra, Black hollyhock, Dahlias, dye gardens, dye plants, Eucalyptus gunnii, growing your own dye plants, Japanese indigo, Lythrum salicaria, natural dyeing, Persicaria tinctoria, Purple loosestrife | Permalink. 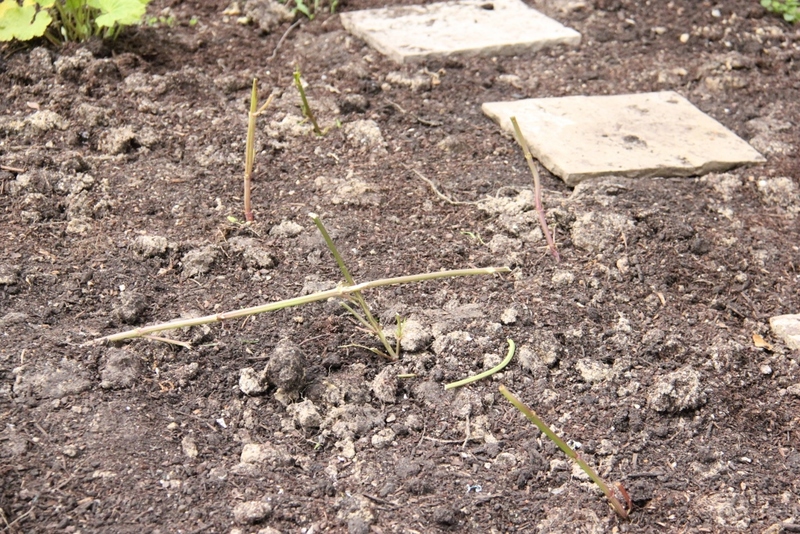 Now I am not a superstitious person, but I am seriously beginning to think there is an evil curse on my brand new flower bed, which was especially created so that I have more room to grow dye plants. So far, nothing that I have tried to grow on that bed has actually been successful. I spotted the first signs of trouble after the first plants were planted there. These were some dyer’s chamomile and hollyhock plants that were transferred there from a raised bed where they had previously been growing quite happily. On the new bed, they just sulked, they literally have not grown at all since they were transplanted a few months ago. Then, I tried to sow some woad and purple fennel seeds there. None germinated, not a single seed. I must admit that this might have been my own fault. I sowed the seeds during a dry spell, and although I did water them (occasionally), perhaps I just didn’t do it enough. But I also started to suspect there might be a problem with the soil. The soil around here is incredibly thick and sticky clay, and I knew that to have any chance of growing anything in it I’d need lots of extra compost as a soil improver. Someone told me that the best way to improve heavy clay would be to use fully composted bark to improve the structure. So I bought a truck load of the stuff, and on my other flower beds it has worked very well as a mulch, it does a good job suppressing weeds. But perhaps it was a mistake to use it when establishing a new flower bed? Perhaps it doesn’t contain enough nutrients, and so it’s not the ideal stuff to be dug in? I don’t know if that is the case, but clearly something had to be done so I bought some standard compost and had the bed completely dug over again with lots and lots of this new compost added in. So after this I dared to plant some plants into the bed again. I planted some tickseed, tagetes and purple loosestrife that I had grown from seed in the greenhouse. But only a few days after, I noticed that most of the tickseed had been eaten, probably by rabbits . 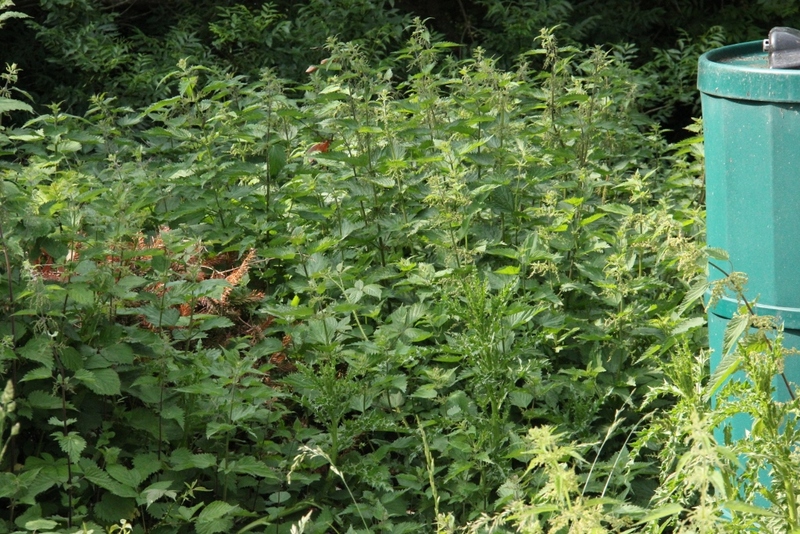 It was too late to take any action right then, and the following morning when I went back, the rest were, as I had feared, completely devoured and some of the purple loosestrife had been nibbled too. Of course I knew there are rabbits about (they are very cute, sweet-looking bunny rabbits and there are a lot of them), but on the whole they have left my perennials alone. Fruit trees get nibbled instantly, but perennials, for some reason, have been spared. Now I know it was only because they are fussy eaters and were only waiting for me to offer them juicier types of plants. Tickseed, preferably. If I am completely honest with myself, I do know what the curse afflicting my dye garden is called. It’s the “Curse of the Inexperienced and Over-Enthusiastic Gardener“. No matter how many garden books you read, gardeners have to make their own mistakes before they learn. Not that I am a complete novice with gardening – I have spent over ten years of making all manner of gardening mistakes – it’s just that I have only had a garden bigger than a postage stamp for a few years, and at my rate, I reckon I need at least ten more years of intense practising and more mistake-making before I can be more certain of reliable success. And one lesson I need to learn straight away is not to make over-ambitious plans, not to attempt so much that I will be rushing and taking short-cuts, hoping that I can get away with them (because I probably won’t). 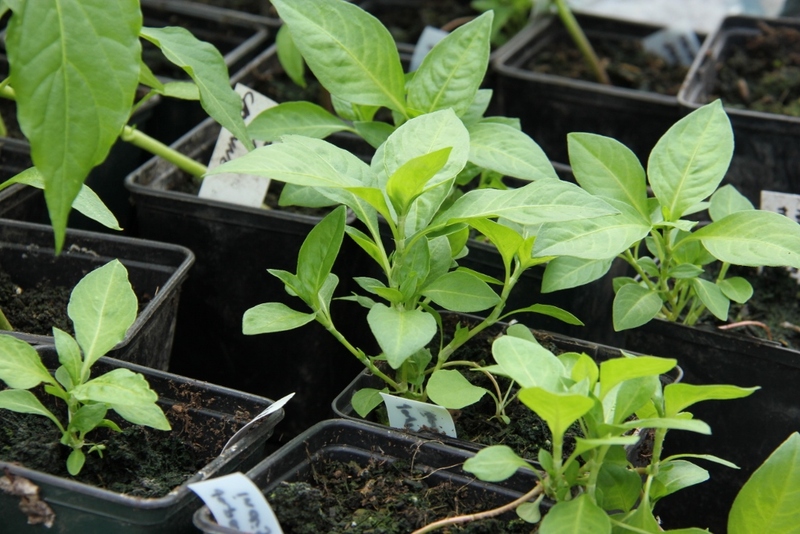 It’s easy enough to grow lots of plants from seed, but you need the time and the energy to plant them on before they start suffering in pots that are getting too small, water them properly for weeks afterwards and protect them from all kinds of beasties big and small (ideally before the plants get completely devoured). And this year, poor health hasn’t made it easy to keep on top things either (which is the reason why I have been rather quiet on the blogging front recently). But luckily, it hasn’t all been a failure. Some of my other dye plants have grown well and even on the health front I have picked up a little bit over the last couple of weeks, so I am hoping I’ll finally get a chance to do some dyeing this week. So lets hope I’ll be able to report some more successful results to you soon! 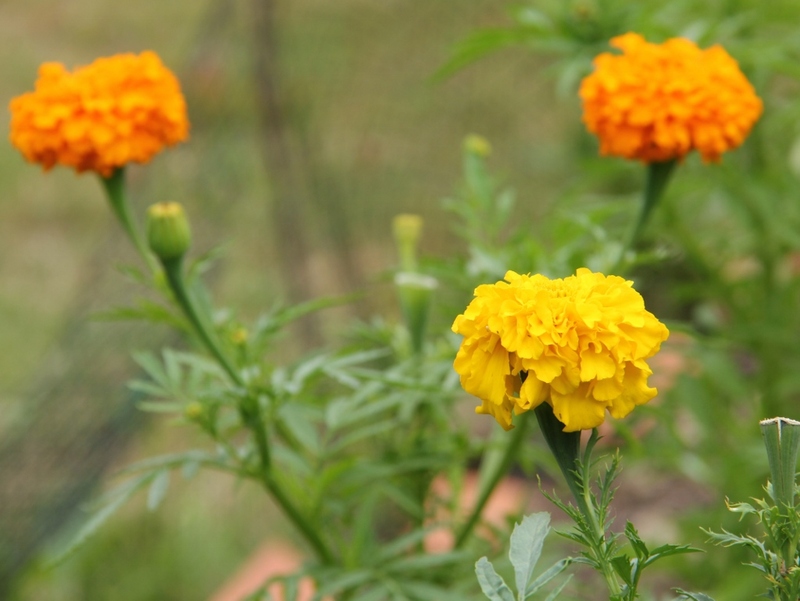 Categories: Growing Dye Plants | Tags: dye gardens, dye plants, growing dye plants | Permalink. Given that this spring has been the second coldest on record, and so far there’s no sign of the weather getting any warmer or sunnier (it’s snowing here even today), my dyeing season hasn’t really got started yet. I dye in an unheated outbuilding which has no window, so it’s not really a place where I fancy hanging around in cold and damp weather. But my dyeing fingers are definitely getting very itchy by now, so I have been using this seasonal delay in getting super organised and prepared. Last year was my first dyeing year, and I started like every does, full of enthusiasm and no idea what I was doing, and improvising as I went along. But towards the end of the season, I had established a way of working that suits me and was naturally getting more organised about it. I also learned that natural dyeing definitely brings out the inner scientist in me, I like trying to get as many colours from a particular plant as I can, and enjoy experimenting with different mordants and modifiers. And as I am still very much a beginner, there are so many dye plants that I haven’t tried yet, so this year I am trying to grow an even longer list of plants to try, as I wrote here (well as long as my seeds just agree to co-operate and germinate in this cold weather). 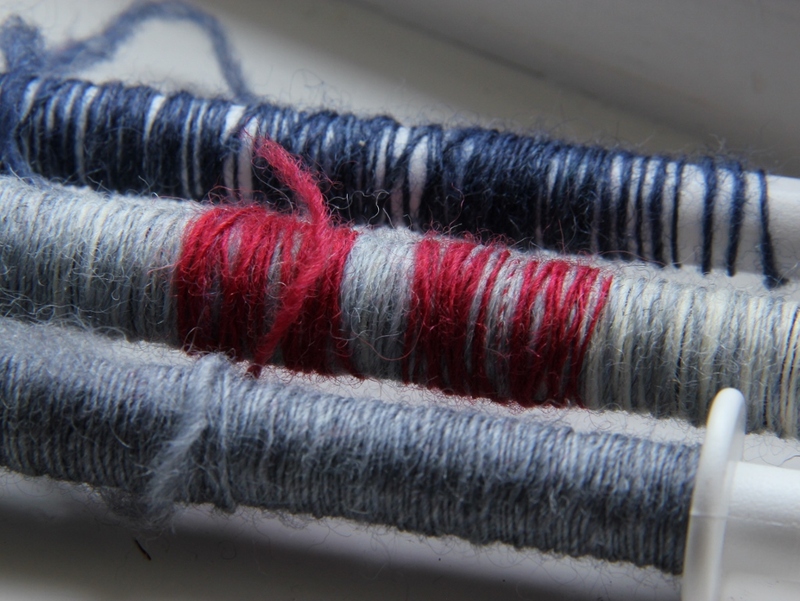 This year, having learned the basics, I also want to take my dyeing experiments even further. 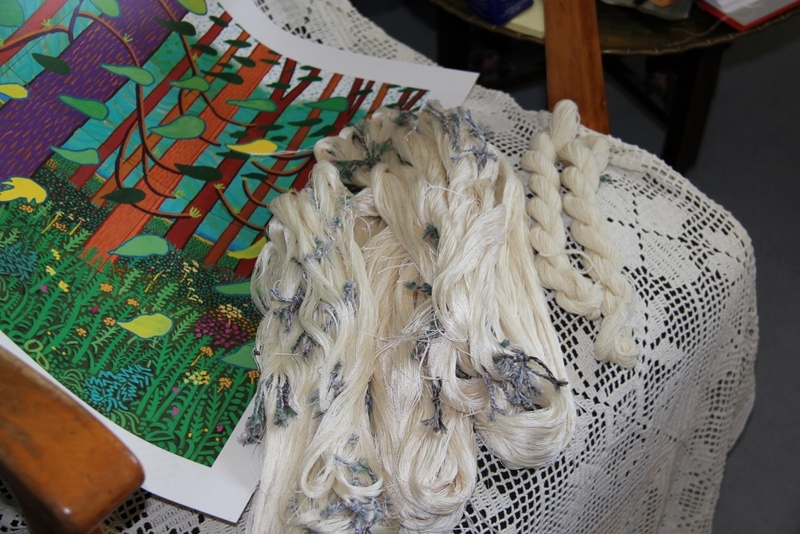 I want to try new types of materials, such as silk and cotton, and cotton being a plant fibre of course requires learning about how to mordant it. I also want to try making my own mordants from plants such as willow and rhubarb leaves. So this season, if all goes to plan, in any given dyeing session there will be a lot of more fibre types and several different mordants to take into account. So that’s 6 skeins per mordant, and if I want to try willow and rhubarb mordants, as well as the usual alum and copper, then for any given dye, I’d need at least 24 different skeins. As you can see the amount of skeins you need for this approach can get out of hand very quickly. 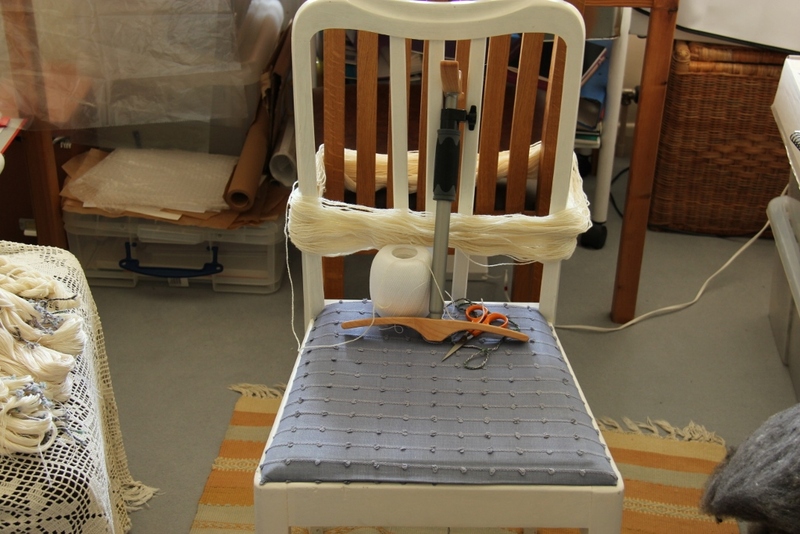 The only way to make it manageable from a cost point of view would be to use either very small skeins (which take a lot of time to make), or perhaps use small squares of fabric just for sampling purposes. I may well end up using fabric rather than yarn samples as they take less time to prepare, but since I promised my dad I’d dye a nice range of colours for his needlework this year and I also would like some naturally dyed embroidery silks for myself, then I won’t be able to avoid having to make lots and lots of mini skeins. 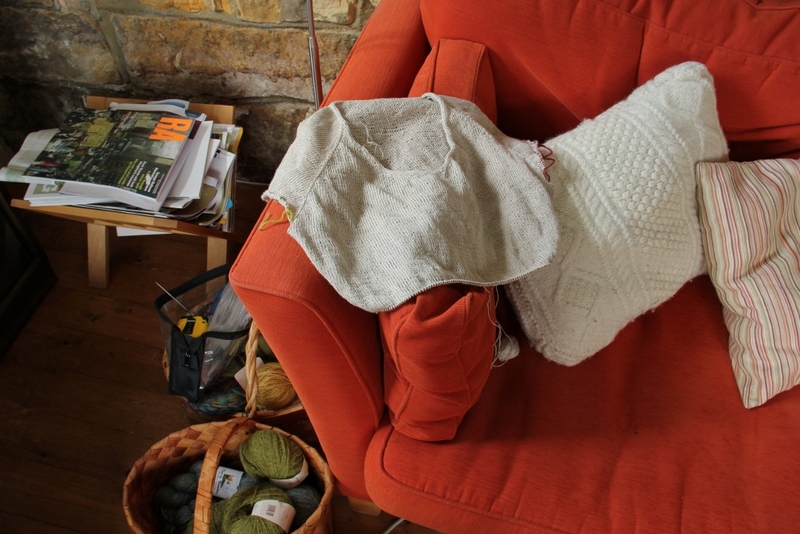 Last year I remember reading about a dyer who would get all her mordanting done in the early summer while waiting for her dye garden to start producing materials to dye with. I remember thinking, wow, that’s so organised, but I would never be able to manage that, I’d never think of it on time. But obviously this idea has been percolating in my head as recently I have started thinking it might actually be a good idea, especially as some people believe that doing mordanting several weeks if not months ahead of the actual dyeing will improve the results. So this year I am going to have a go at separating the mordanting process from the dyeing process, which makes sense if I will be working with at least 4 types of mordant for wool and perhaps a few more for the cotton fabrics. And since I am mainly growing my own dyes, then mordanting early in the season definitely fits well into the natural seasonal rhythm of things. 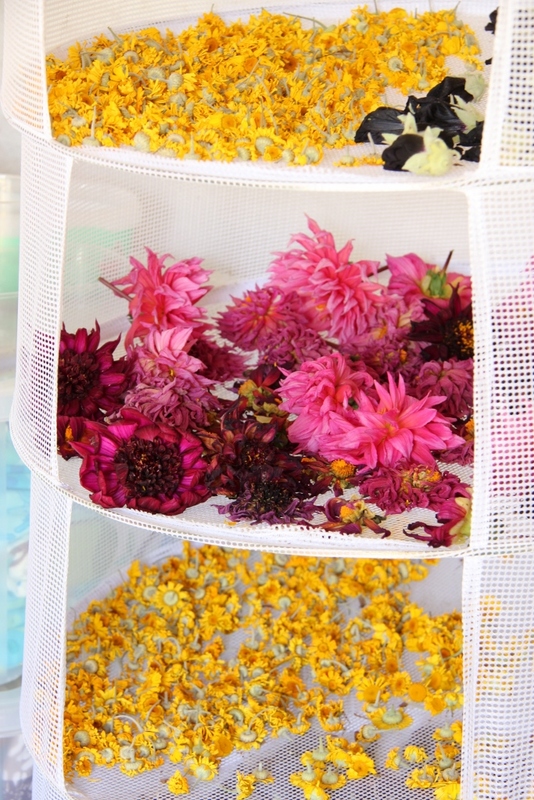 It may be a bit dull first, but by the time your garden is bursting with plants, you can just concentrate on dyeing. And being well prepared may well be the only way I can manage carrying out these grand experimental plans, especially since the dyeing process is physically quite strenuous for me (because of my ME/CFS) even if I keep it simple with using just one mordant and one type of fibre . 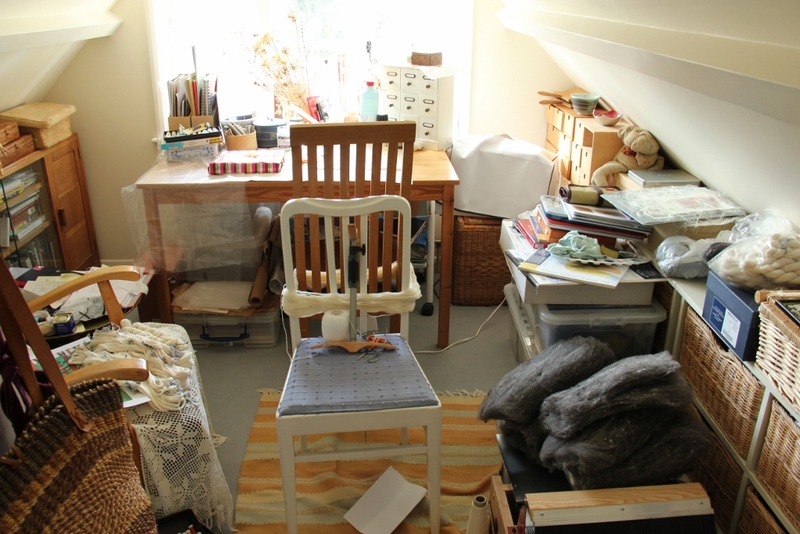 A long day at the dying workshop just isn’t an option for me, so I need to break down the process into smaller steps and being organised is the only way I can reconcile such grand plans with a limited amount of energy. But I’m not entirely convinced that I’ll be able to pull it off being so organised and systematic all summer, I wouldn’t be surprised at all if in the end I just ended up chucking random materials into my dye pots, not bother with labelling anything and instantly forgetting what exactly I had been doing. It’s a bit like gardening. 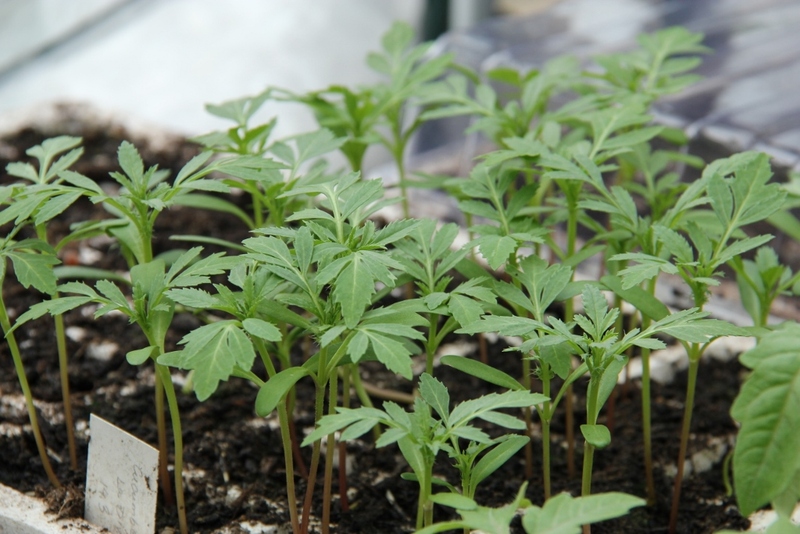 Early in the season you have great plans, and as the season progresses you get more and more overwhelmed with all the seedlings and plants and the amount of work and watering they need. By July, each year I make a solemn vow not to make such big plans ever again. And all winter, I keep thinking “I will resist making big plans, I will resist making big plans, I will resist… “. And so, every single year I end up with plans even grander than the year before. I don’t what it is about me and making over-ambitious plans, I just feel compelled to make them even if I know I already try to do much more than I can possibly manage. Focus and prioritisation just seem way beyond me. And this year, I’ve been going through a bit of a rough patch with my ME, and yet, here I am, completely unable to resist planning for some great new achievements. And who knows, perhaps this year I will actually succeed. 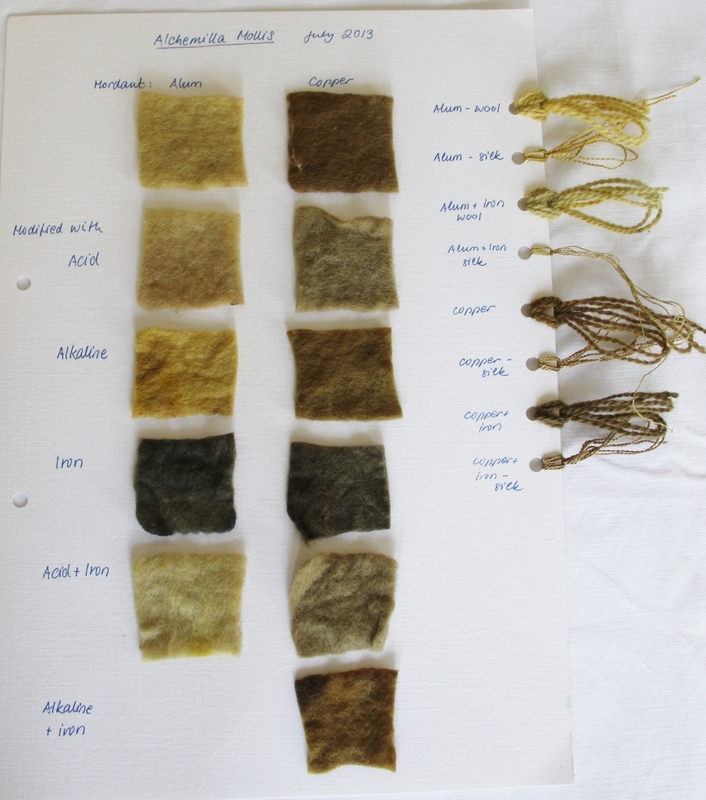 Categories: Dyeing | Tags: getting organised for a new dyeing season, natural dyeing | Permalink. The craft world is full of mysterious dysfunctions. Some people suffer from Startitis, others from the Second-Sock Syndrome. And all those U.F.Os (UnFinished Objects), surely they are symptoms of that most mysterious dysfunction of all, Losing-One’s-Mojo-itis. I certainly have my fair share of U.F.Os, but I don’t consider it a huge problem. I like variety and believe in following my inspiration, and not forcing myself to toil on a project that I don’t feel like doing. Crafts are a passion, a joyful hobby, not a duty. If something doesn’t inspire, just move on, leave it until it does. So to me at least, a U.F.O is just a project whose time has not yet come (although I do not deny that, occasionally, it’s a good idea to see what you can find in your craft baskets and try to finish some of them. January is often a good time for this, when you are in a mood for some worthy activities and need to prove to yourself that you, despite all the evidence to the contrary, actually have some self-discipline and the will power to finish a project). My spinning basket is full of these Projects-Whose-Time-Has-Not-Yet-Come (or PWTHNYCs, which I do admit is not as catchy as UFO). But there is a reason for this, and it is a fairly rational one. 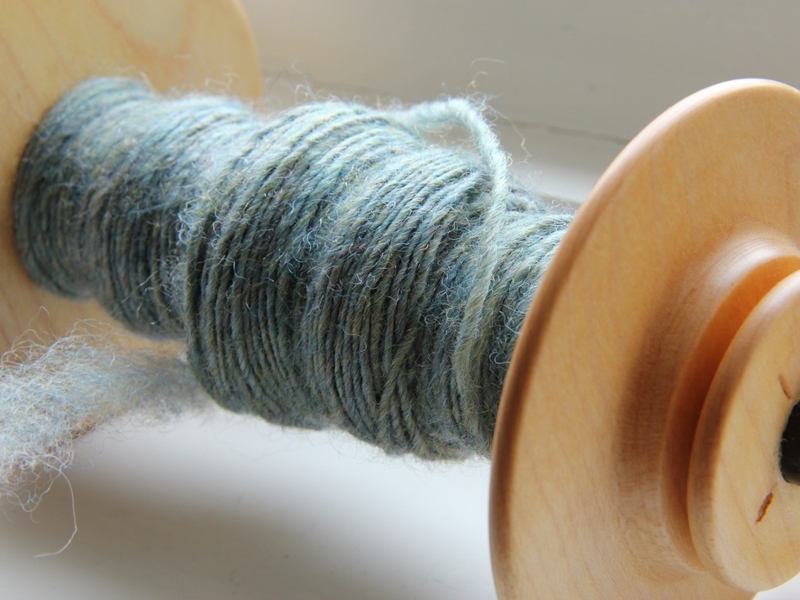 Spinning to me is such a soothing and relaxing activity that I always have some wool on the go. Often I don’t even spin for a specific project, I just spin. I know it would probably be better if you had a specific use in mind for the wool before you start. That way, you can try out different approaches, sample and determine the best way to proceed. And I do that, too, when I need to. But often my spinning is not that rational and goal-oriented. Spinning is something I do if I feel too tired to think about anything else, or feel the need for some crafty therapy if I am in a grumpy mood (of course I spin in good moments too). In those tired or grumpy moments, I just feel the need to spin something, no matter what exactly it is. The less I have to think the better. So if I don’t already have a project on the go when the I-Must-Spin-NOW moment comes, I grab the nearest wool that inspires me at that moment and just start spinning. 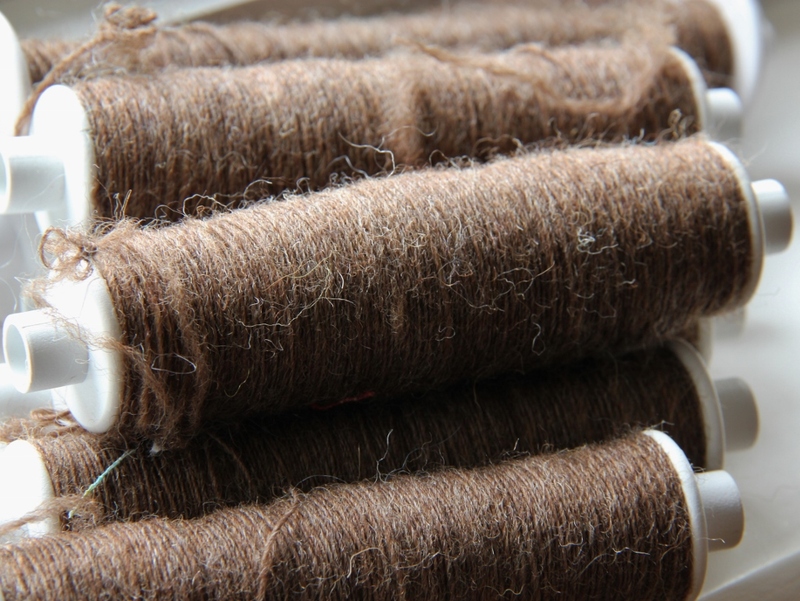 And often the first important decision – how to spin the wool – is not such a big decision at all: the wool itself, and the form it comes in, typically suggests a good general approach. 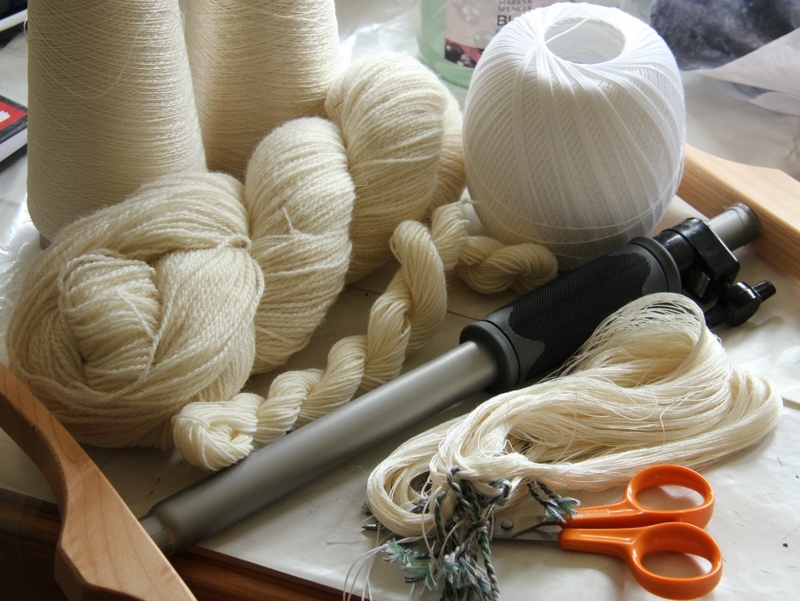 If it is long fiber, and comes in a top form, I’ll do worsted in short draw. And a good supply of ready prepared top in some beautiful colour is always a good thing to have on these moments. But I love long draw spinning, and whenever I have short enough fibre, I will do that. I aim for twist that sort of looks about right for that wool. Not very scientific at all (no matter what Anne Field in Spinning Beyond Basics recommends). 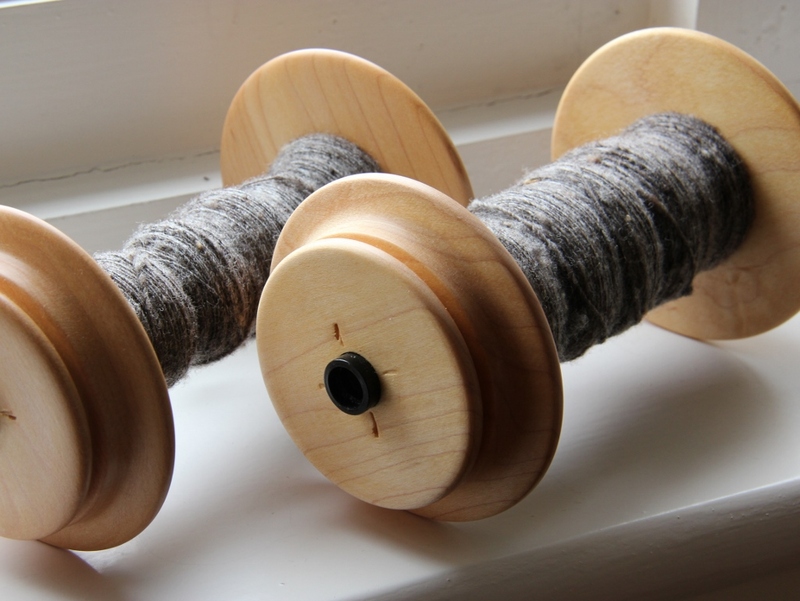 But when it comes to plying, you need to commit to some sort of an outcome: do you want two, three (or even more) plies? And for that, it definitely helps if you know what you are going to use the yarn for. So, quite often, my spinning projects enter a period of hibernation at this point. As a result, I have a basket full of bobbins that have some singles yarn that is waiting to be plied. And I am happy to let them wait until the right time comes and I know what I want to do with them. So, you see, they are just PWTHNYCs waiting for the right time. This approach does mean you need lots of bobbins, and we all know wooden ones are very expensive. So it was necessary for me to invest in a bobbin winder and buy some plastic weaving bobbins for storage. But yarn stored this way takes less room than a finished skein, so it is not a bad way of storing your stash. 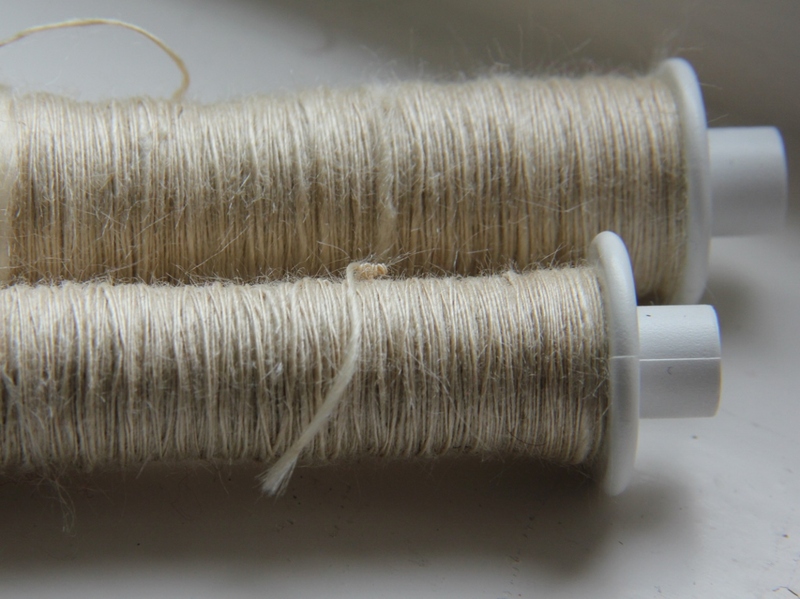 My first silk spinning experiment using Tussah silk top. I need to ply this into both 2-ply and 3-ply yarn and knit some samples. I’m pretty certain this is grey Shetland, but why on two different bobbins?? 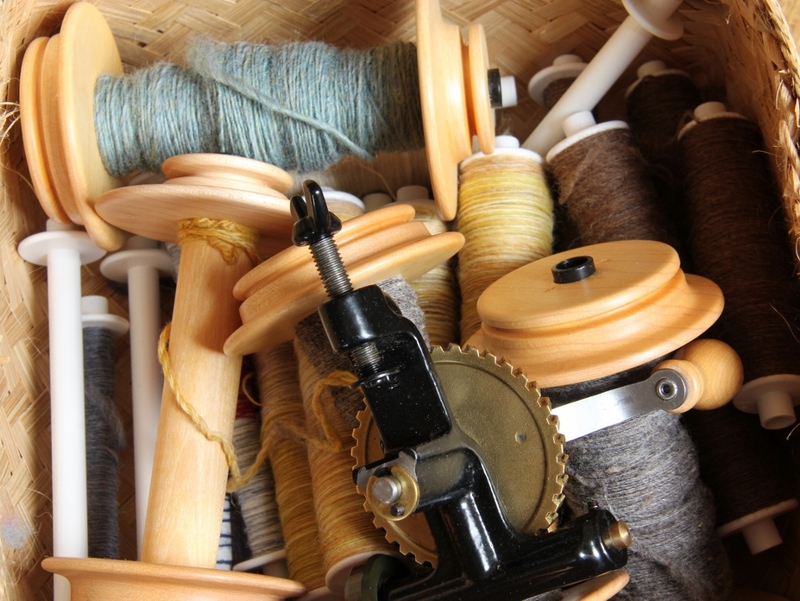 Categories: Spinning | Tags: Spinning | Permalink. 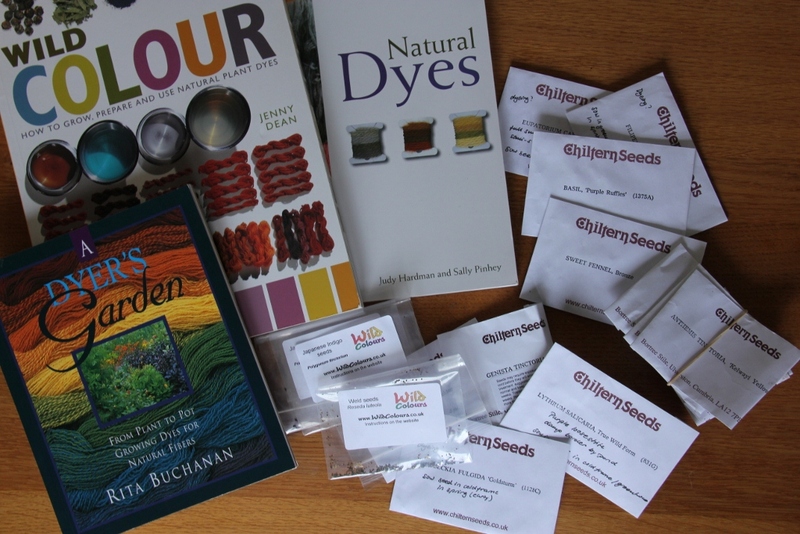 With my trusted dyeing books and a few packets of seeds, I’m ready for the new season in the garden! It has been a cold and grey spring here so far. We had two wonderfully sunny days last week, the crocuses and bees were out at last, but unfortunately it didn’t last. This week the winter is back we had 10cm of snow on the ground this morning. 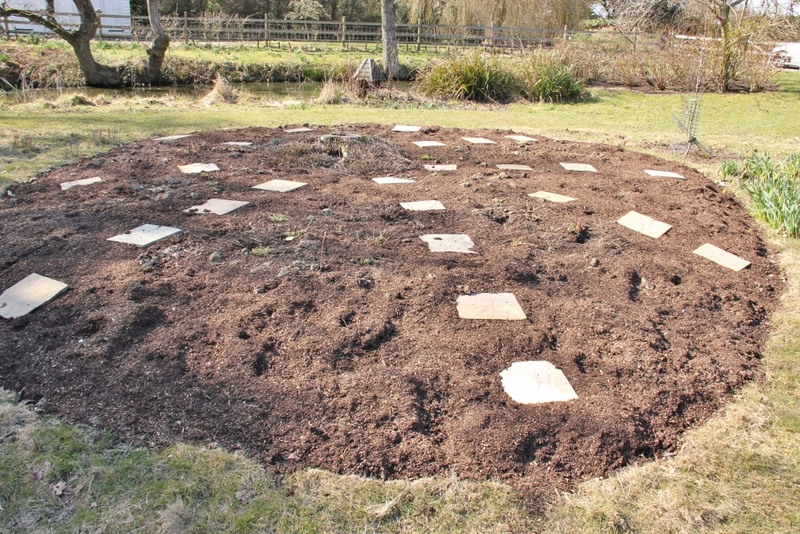 But it’s prime seed sowing season nevertheless, and it has been keeping me busy in the last few weeks. To avoid the inevitable spring rush, I was super-organised in the autumn and ordered my seeds already then. And yet, as I have been going through those seeds now, I realised that some of my seeds should have been sown already in the autumn, and quite a few need a period of cold before they germinate. I can’t believe it – I’m behind already and I have only just started!! Last year was my first year of growing dye plants, and this year I have an even bigger list of plants I want to try to grow. I have a new border dedicated to dye plants, which is pretty exciting. As well as useful, I want this border to be ornamental too so I have chosen plants that look pretty as well as are suitable for dyeing. 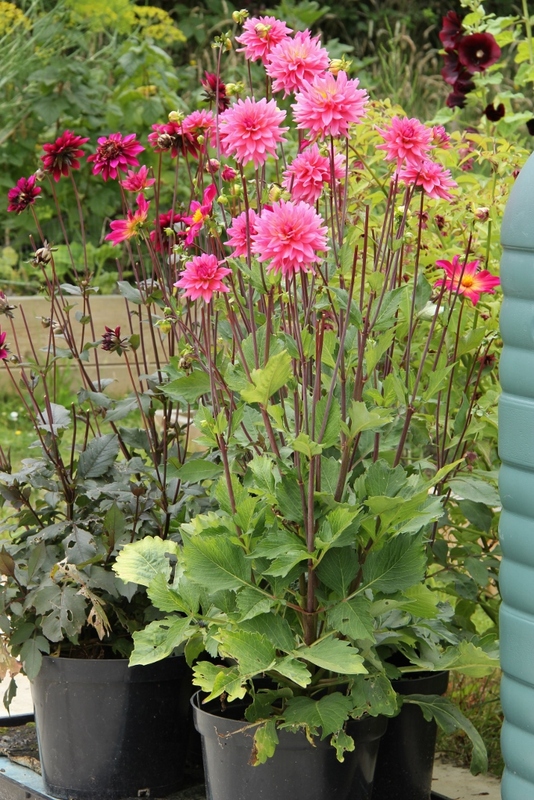 I am also going to scatter a few of these multi-functional plants in my existing ornamental flower borders (just to have even more room for them!). So here is the plan for dye plants that I am going to grow this year. Just for my own benefit so that I remember what I should be doing, I’ve grouped the plants according to sowing time and method. 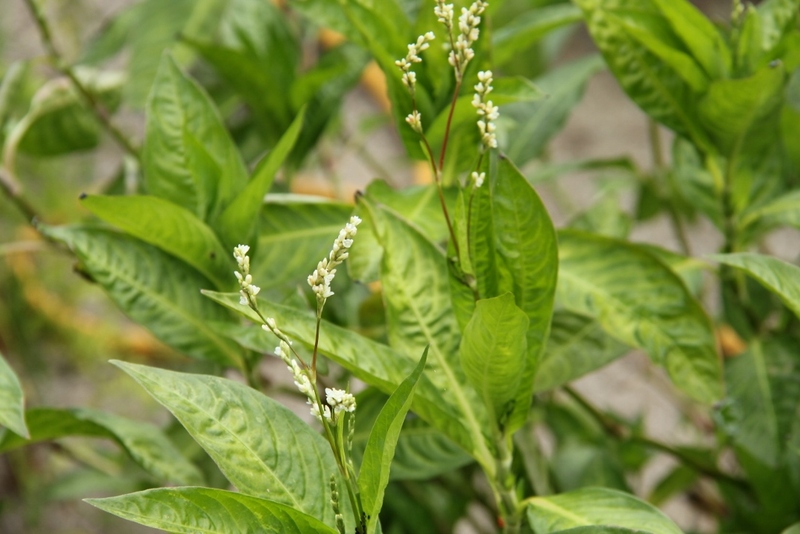 Japanese Indigo (Polygonum tinctorium). After my success with woad last year, I’m very excited to try the Japanese indigo this year.This needs a long season especially if you want the plants to set seed. It is not hardy so I have started these in-house, soon I will move them to heated propagators in my unheated greenhouse and hope to keep them going that way until late May when I will plant them out. 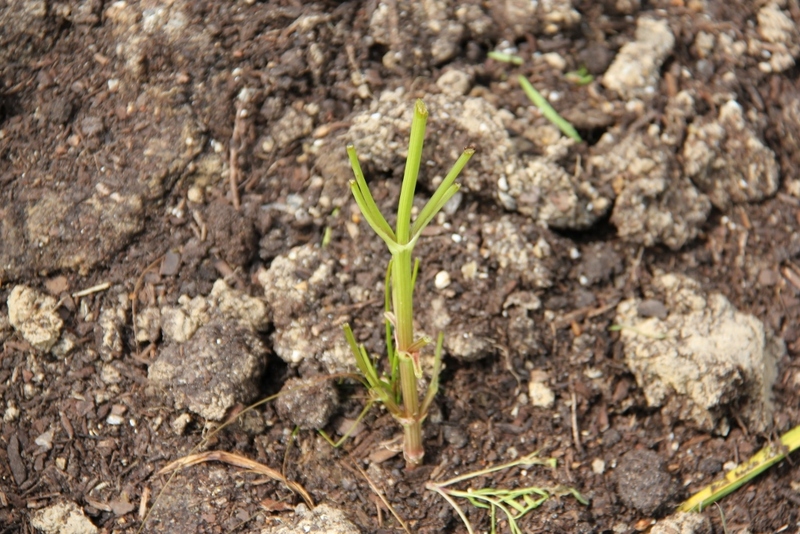 Dyer’s Broom (Genista tinctoria), this will need an exposure to cold before germinating. After sowing, I kept the seeds in the house for 2 weeks, then put them outside for the chill treatment. And I already have a few plants in pots that I managed to grow last year, but never had the time to plant somewhere permanent. 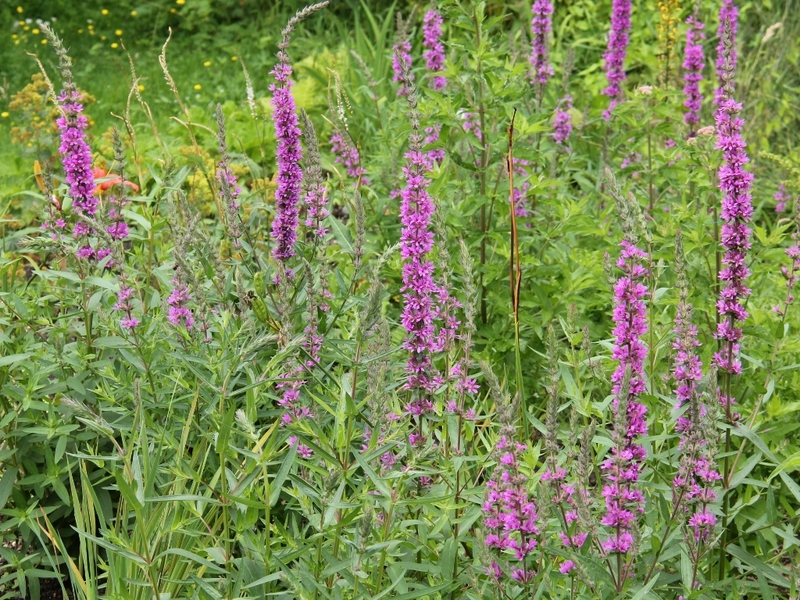 Purple loosestrife (Lythrum Salicaria). This is a pretty native plant with purple flowers that is ornamental as well as suitable for dyeing. It needs damp soil, which luckily we have. We have a pond in the garden as well as very sticky clay, so by the pond it is often completely soggy. 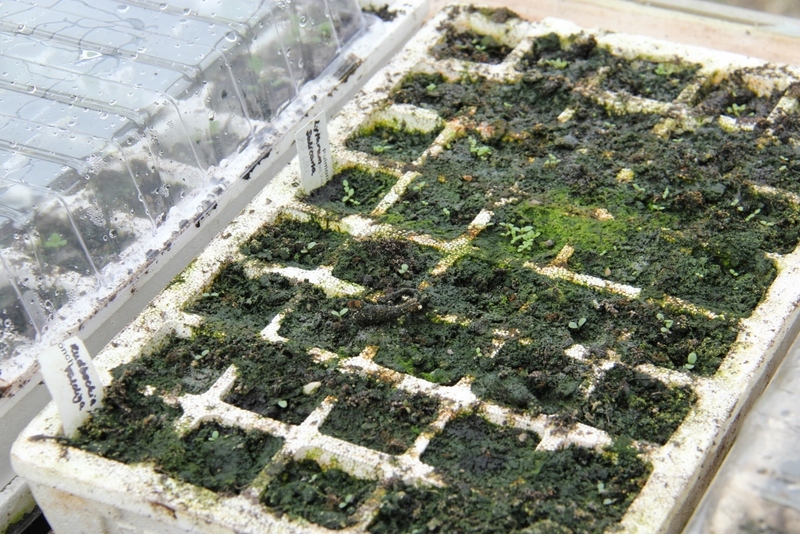 Seeds should be sown in winter in a coldframe. Goldenrod (I’m trying Solidago canadensis ‘Golden Baby’). Seeds should be sown in late winter/early spring. Black-eye Susan (Rudbeckia fuldiga ‘Goldsturm‘). Sowing in early spring in a cold frame. Hemp Agrimony (Eupatorium cannabinum). This is a very tall perennial that butterflies adore. It can also be used for dyeing. 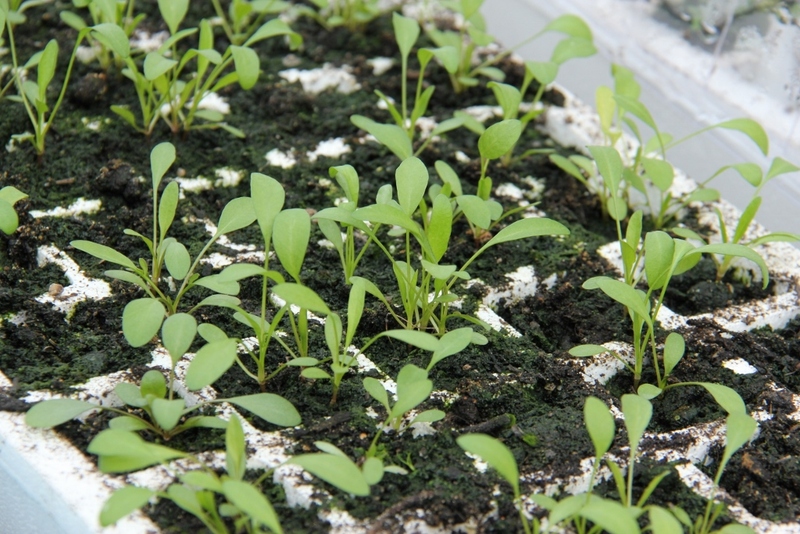 Seeds can be sown in a cold frame or unheated greenhouse in the spring. Medowsweet (Filipendula Ulmaria). Another multifuctional plant that needs damp conditions ideally by a pond. Tickseed (Coreopsis tinctoria). A perfect multi-functional plant that I grew last year. It looks pretty and gives a nice range of yellow, oranges and brick red as I wrote here. Purple basil (I am trying variety ‘Purple Ruffles’). Not a hardy plant so needs to started indoors. 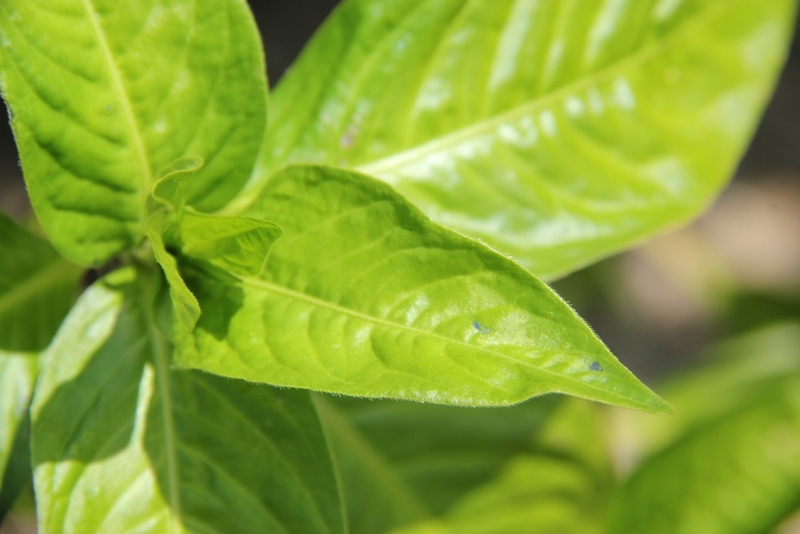 My soil is not ideal for basil, but I am going to try it anyway, and perhaps keep some in pots. Red Perilla. This is an oriental cooking vegetable that is decorative too. The seeds only germinate after their dormancy is broken. Apparently keeping the seeds in a fridge for 1-3 months before sowing might do the trick. So I am putting them into the fridge now and sow a bit later on in the spring. Bronze fennel. A truly multi-functional plant, very ornamental, used in cooking and also dyeing. 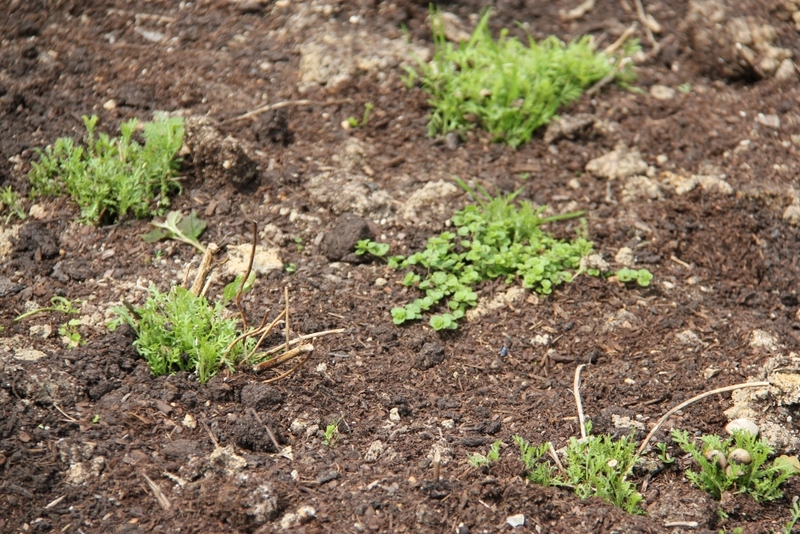 The seedling of fennel do not transplant well so it’s best sown directly in late spring. Woad (Isatis tinctoria). Last year I was more successful with my woad when sown directly (the seeds I tried to propagate in the greenhouse just didn’t germinate). It’s a hungry plant so needs extra fertiliser once it gets going. Weld (Reseda luteola). 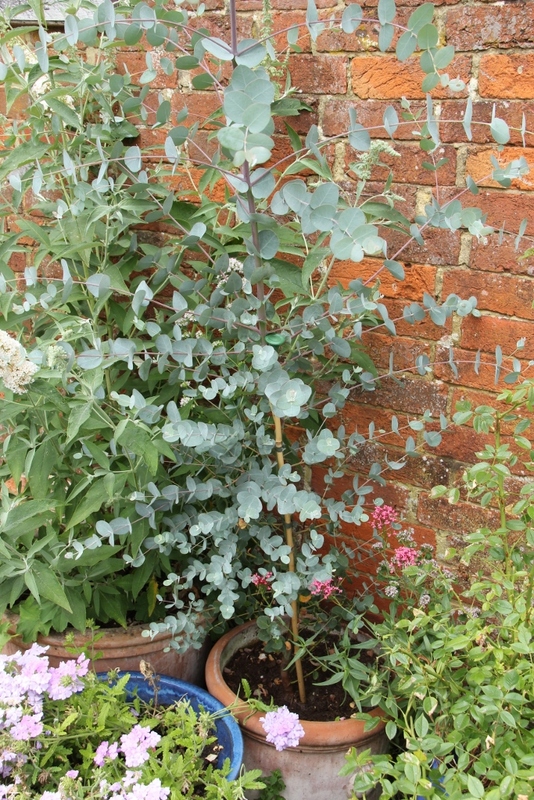 Another one that I just could not get to germinate in the greenhouse last year, so this year I am going to try sowing it directly in a dry gravelly ground next to the south facing wall of our garage – lets see if I am more successful this way. Dyer’s Chamomile (Anthemis tinctoria). This is a perennial plant so it should flower again this year. 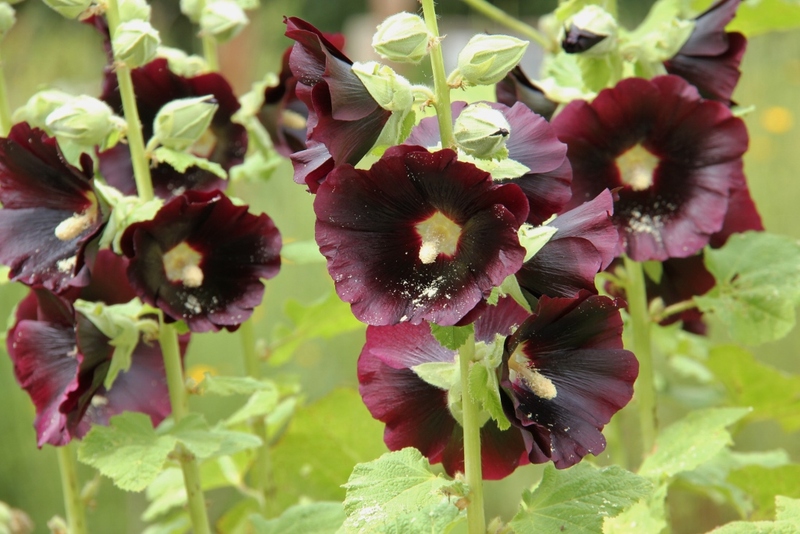 Black Hollyhock (Althaea rosea var. Nigra). As I have been reading about the dyeing experiments by Pia from Colour Cottage with this plant, I am so happy I already started some plants last year. It’s a biennial so mine should flower this year. Rhubarb. I planted quite a few rhubarb plants in my kitchen garden last year. As well as the stems that provide nice puddings, the leaves (which are poisonous) can be used as a mordant. The roots you can use as dye. But you are supposed to let them grow 2-3 years before starting to harvest them so I may need leave mine alone this year. Buckthorn (Rhamnus species). This is a hedging plant, and I am going to fill some gaps in our hedge with some plants that I bought last year and have been growing on in pots. Elder (Sambucus nigra). I’m going to plant both the green and black varieties in my garden this year. 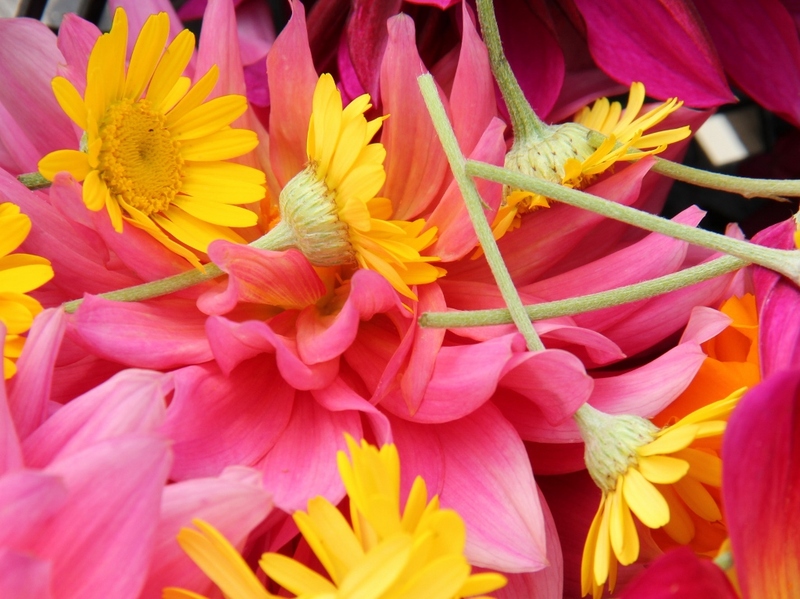 The flowers and berries can be used in cooking and the leaves and the flowers can be used in dyeing. Blackthorn, “Sloe” (Prunus spinosa). There’s a wild sloe bush in the forest near our house the berries of which we’ve used to make wonderful sloe gin but I’d like a sloe bush in my own garden too. Now that I am looking at this, I’m realising it’s quite a list. I am always way too over-enthusiastic and ambitious with my garden plans and by April I know I am in trouble. Despite good intentions this happens every year, so I’m sure this year won’t be an exception. But being sensible is not fun, is it? 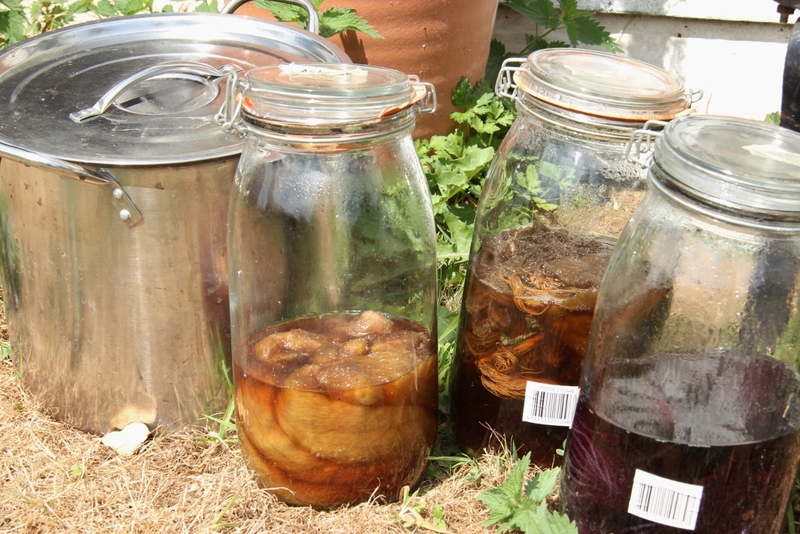 Categories: Growing Dye Plants | Tags: dye gardening, growing your own dye plants, natural dyeing | Permalink.